The hare will be marinated in a sauce thus prepared: thinly cut and chop up together onion, rue, thyme and pepper. Add some garum. Take a hare that has already been cleaned and spread the sauce on it, then put it in a pan and into the oven. 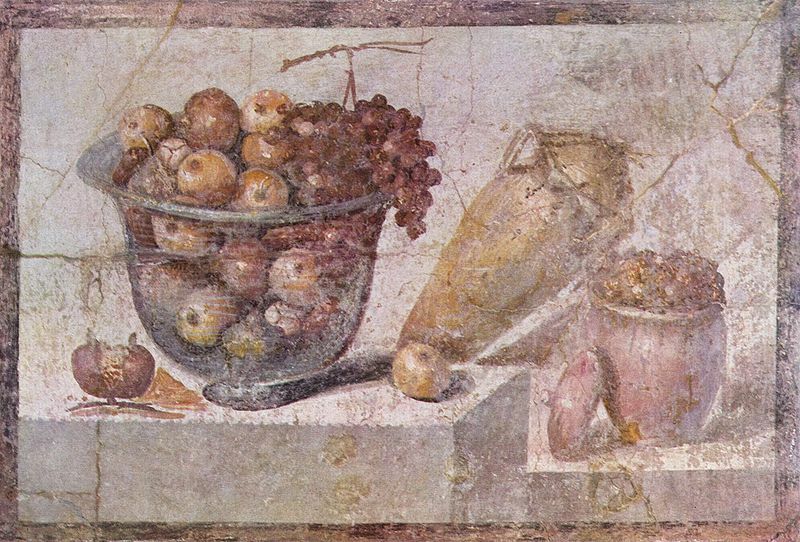 While it is cooking, either spread or pour on it, repeatedly, another sauce, that you would have prepared beforehand, made with oil, wine, garum, onion, rue, pepper and four dates. Choose a nice kid. Prepare it and put it into the oven. In the meantime, chop up onion, rue, savory, laserpicium and Damascus plum without stone. Add oil, wine and garum. Cook and once the kid is ready and out of the oven, pour the sauce over it and serve it. Chop up some pepper, mint, lovage, raisins, pine nuts, dates. Add some fresh cheese mixed with honey, vinegar and cooked must. Remove the stone from some dates and stuff them with minced pepper, walnuts or pine nuts. Pour some salt over them, cook in honey. Serve them. What do think of them? There are some unusual food combinations, aren’t there? I’m not sure I would have had the “guts” to taste them, although if the Ancient Romans loved them, they must have been quite tasty. Would you have tried them?